Why is it so hard for business leaders to admit they know less than they thought they did about their circumstances and must instead come to grips with the facts in order to confront reality? Before we can answer that question, we must first ask: Why is it that we expect CEOs and others in the executive leadership suite to have all the best answers instead of asking all the best questions? The answer to these rhetorical questions lies in the immense pressure to justify a CEO’s leadership to a board of directors and the so-called shareholders they represent. I say “so-called” because, at least in our publicly traded corporations, shareholders are often algorithms that could care less whether or not the company is sound or sustainable, but rather whether the price will go up or down in the next millisecond. Algorithms aside, we all seem to understand CEOs who fail to produce profits and growth that supersede their competitors will be punished in the stock market and, eventually, will be forced out for one who can. Fortune 500 CEO tenure has been dropping since 2000 and is now down to 4.6 years. The same study cited the differences between good and bad CEOs were largely driven by unexpected traits. Execution alignment was important, but it was not as important as managing complexity, engaging and inspiring the workforce, and instilling trust in company culture. In the same Fortune interview last week, Merlo described how his company had to ask hard questions. If they’re a healthcare company, why are they selling tobacco products? Why are they selling painkillers they know will contribute to the opioid epidemic? Whether Merlo is a good example of a teachable business leader can be debated: He was also the CEO with the worst pay gap with employees in the Fortune 500. Role model or not, the question remains valid: If the CEO isn’t willing to ask tough, self-critical questions, who will? “Making Business Leaders Teachable” is the theme for Tuesday, April 24 agenda at RECONVERGE:G2 2018. And we think we’ve got an outstanding plan for how to do just that! Tuesday morning, after breakfast and check-in, we’ll enjoy remarks from one of the most innovative CEOs in the region – someone we’ll introduce you to soon in a future post. 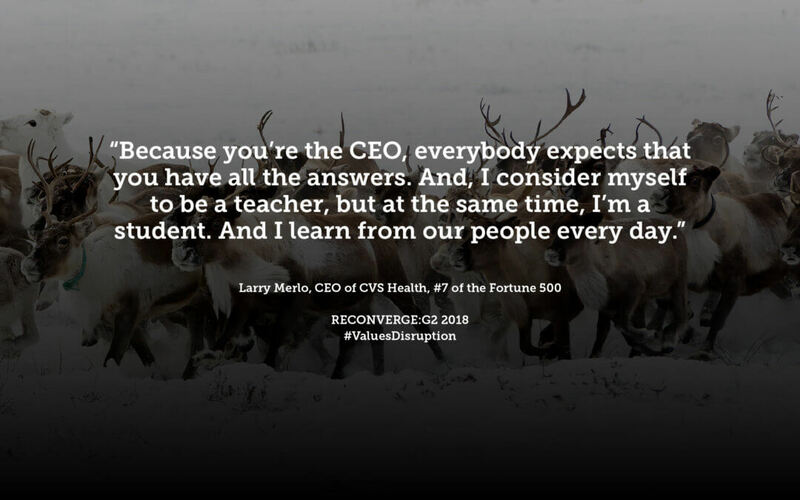 This CEO founded a company that created their category almost 40 years ago and continued to ask the tough questions necessary to fulfill a mission in the world that goes far beyond profits or growth. Next, it’s time to meet our 2018 Mathews Medal winners! Every year since 2012, Aurora WDC has brought two university students with competitively selected essays on the role intelligence has to play in business together with the most innovative intelligence leaders from business to push their learning to another level, on both sides of the podium. The Jim Mathews Award for Intelligence Excellence has become a prestigious and competitive honor for those who achieve it. If you know of university students who would qualify, let them know that essay submissions are now being taken. After lunch, we’ll have three more such “dynamic duo” sessions on topics related to how intelligence makes business leaders more teachable, concluding our day with a 3-hour reception and dinner featuring our second annual “Presentation Smackdown” where competitors go head-to-head presenting slides they’ve never seen before and must use to argue diametrically opposed hypotheses effectively. Only the bravest presenters should try this in the wild, because the audience will select a winner based solely on how influential (and entertaining) the argument was! But you’ll miss all of that, if you don’t register and tickets are already going fast!